Geri Care Vitamin E 200 IU Softgels in bottle of 100. Vitamin E is an important vitamin that is required for the proper function of many organs in the body. It is also an antioxidant. This means that is helps to slow down processes that damage cells. MAY ALSO Contain: Geletin, Glycerin, Soybean Oil. Directions: Adults - One softgel daily, preferably with a meal, as a dietary supplement, or as recommended by your physician. WARNING: If you are pregnant, nursing, taking medications, planning any medical procedure or have any medical condition, consult your doctor before use. Discontinue use and consult your doctor if any adverse reactions occur. 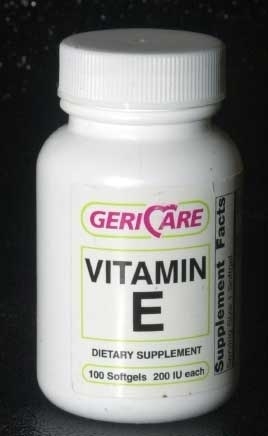 Geri Care Vitamin E is a fat soluble vitamin.